Appeared in 13 matches with nine starts…recorded 30 kills and 62 attempts for a .258 hitting percentage…made 12 digs and 38 total blocks…recorded one service ace. 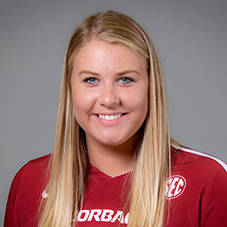 Stripp comes to Fayetteville with three years of experience as a member of Denmark’s Youth and Senior National teams. At the most recent North European Volleyball Zonal Association (NEVZA) Championships, she was named best middle blocker in helping the Danish U19 team to a gold medal; the previous year saw Stripp and Denmark take NEVZA bronze. Additionally, she helped Holte win the Nordic Club Championship in her final year with the club. Maia is the daughter of Lars and Ulla Stripp, and her older sister Malene is a tennis student-athlete at the University of Oklahoma. Stripp is the program’s first student-athlete from Denmark. She is planning to major in elementary education at Arkansas.